Architect Philip Johnson designed the New York State Pavilion for the 1964-65 World’s Fair, which drew an estimated 51 million visitors to Flushing Meadows-Corona Park for a celebration of culture, technology, and “man's achievement on a shrinking globe in an expanding universe.” A skyline-defining feature of the borough of Queens, the Pavilion is a monumental concrete and steel structure combining a theater, three observation towers, and a 100-foot high, open-air elliptical ring. 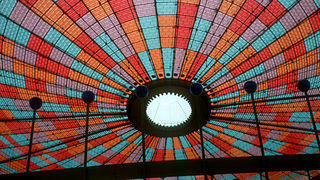 Dubbed the “Tent of Tomorrow,” the Pavilion’s main exhibition space dazzled and delighted fairgoers with the world’s largest suspension roof and a 567-panel terrazzo road map of the Empire State. While a vast majority of the structures constructed for the World’s Fair were either demolished or relocated, the Pavilion remained in active use for years as a community roller rink and concert venue. However, by 1976, the tent’s iconic roof was declared unstable and removed, leaving the ornate map exposed to the elements and the Pavilion’s future in question. Even in its current deteriorated state, the Pavilion remains a focal point of a beautiful, 1,255-acre urban landscape that is Queens' largest green space and one of New York City's flagship parks. Owned by the city and administered by the Parks Department, the Pavilion is structurally stable, but needs critical repairs and restoration after years of disuse. Recent studies have shown that it would cost approximately $14 million to demolish the Pavilion, $40 million to fully repair and preserve it, and up to $72 million to reopen it to accommodate a program of full reuse. The Pavilion featured three observation towers. 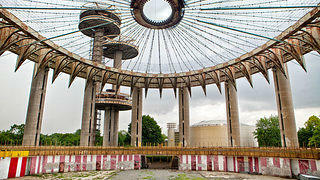 The Pavilion now sits vacant and unused in Queens’ largest park. By 1976, the roof was declared unstable and removed. 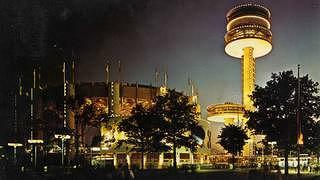 Held at a time of great cultural and technological transformation, the 1964-65 World’s Fair – the largest ever hosted in the United States – embodied the Space Age optimism of mid-century America. That sentiment pervaded the architecture and design of the fair, which featured flying saucer shapes, vast cantilevers, and towering concrete forms. Listed on the National Register of Historic Places, the New York State Pavilion is a remarkable relic not only of World’s Fair architecture, but also of this fascinating era in American history. Commissioned by Governor Nelson Rockefeller, Philip Johnson was instructed to make the state’s representative building the largest and tallest at the fair. Once it opened, architecture critic Ada Louise Huxtable called it a "runaway success...a sophisticated frivolity...seriously and beautifully constructed. This is carnival with class." 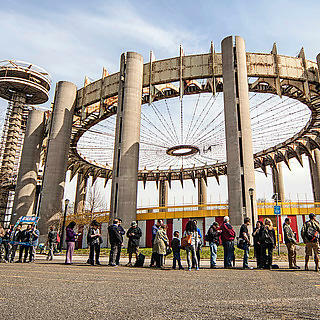 The work of a master architect and a symbol of a captivating cultural moment, the New York State Pavilion is the only element remaining from the 1964-65 World’s Fair that has not yet been restored or adapted. Raise local and national awareness of the significance of the Pavilion. Advocate for the restoration and reuse of the Pavilion as an asset to the local community and visitors to Flushing Meadows-Corona Park. Bring preservation expertise and resources to the reuse efforts. 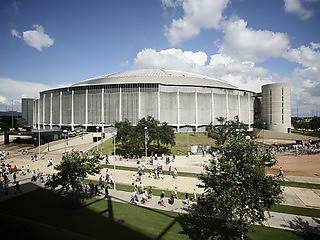 Save and reuse a Modernist icon that has intrigued and inspired millions for over 50 years.